If you want exposure to real estate but don’t want the hassle of managing property yourself, RealtyShares provides a diversified way to invest at low cost. 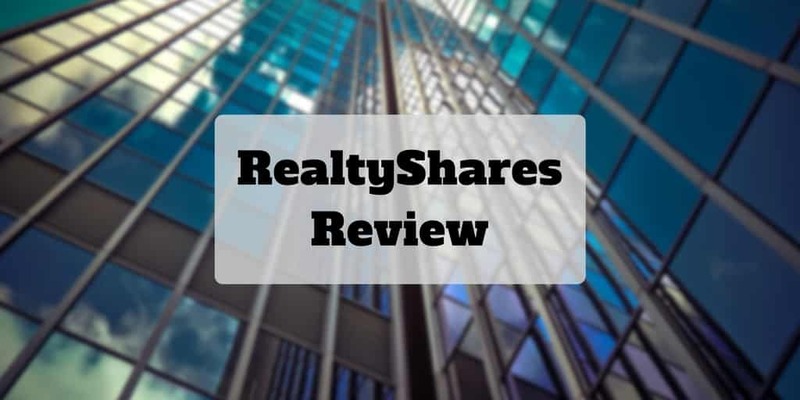 RealtyShares is an online marketplace that connects companies in need of real estate financing with investors, who can pool assets together and buy a portion of a real estate project. 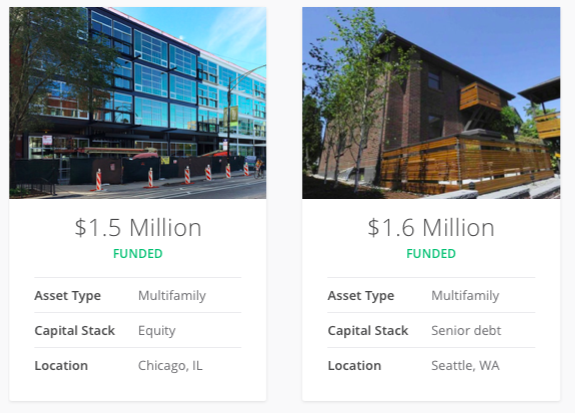 Along with Fundrise and Realty Mogul, who are also online real estate crowdfunding marketplaces, RealtyShares is designed to make real estate investing more accessible, save investors more time and provide more control over investment choices. And unlike a REIT, which selects investment properties without consideration to your preferences, RealtyShares gives you control over which investments you want to participate in so you can avoid certain geographies if you wish or certain types of investment, for example residential or commercial. Best of all, you can get started with as little as $5,000 so you can risk a lot less than a traditional real estate investment and diversify capital across multiple projects so your risk is not concentrated in a single property. RealtyShares investors can diversify risk across multiple properties in multiple states. If you are an accredited investor on the hunt for passive income investing opportunities, RealtyShares is a powerful peer-to-peer platform that simplifies the process. Compared to stock market investing which has its ups and down, real estate investing offers an opportunity for potentially more reliable cash flow. As an asset class, real estate has outperformed the stock market by 2:1 since 2000. Where RealtyShares earns its stripes is by making real estate investing simple for accredited investors and institutions who would otherwise be forced to source residential and commercial property investments, conduct due diligence, manage legal contracts, and deploy a greater chunk of capital into few concentrated real estate plays. By combining assets from many investors and screening real estate opportunities, RealtyShares does the heavy lifting of vetting property investments, shoulders the burden of research, and simplifies real estate investing to the click of a button online. Investors can get started with as little as $5,000 while still enjoying diversified geographic opportunities and the luxury of picking investments that match their financial goals and risk profile. In some cases, a $1,000 minimum investment is accepted. By connecting investors with real estate companies in need of capital to finance projects, RealtyShares creates a win-win because companies can access capital faster and investors can diversify risk more. Only accredited and institutional investors can invest on the RealtyShares online platform. To invest with RealtyShares, you must be an accredited investor, meaning that your income must be at least $200,000 for the past two years or your net worth – excluding your primary residence – must be at least $1,000,000. If you have a spouse and earn a combined income of at least $300,000 annually for more than two years, you also qualify. When you sign up, you will have the opportunity to invest in a broad spectrum of real estate plays from residential to commercial and from multi-family to offices as part of equity or debt investments. The due diligence on property investments is performed by the investment team at RealtyShares, who screen out the vast majority of companies seeking financing, so you can feel more confident that the choices made available to you are thoroughly vetted. 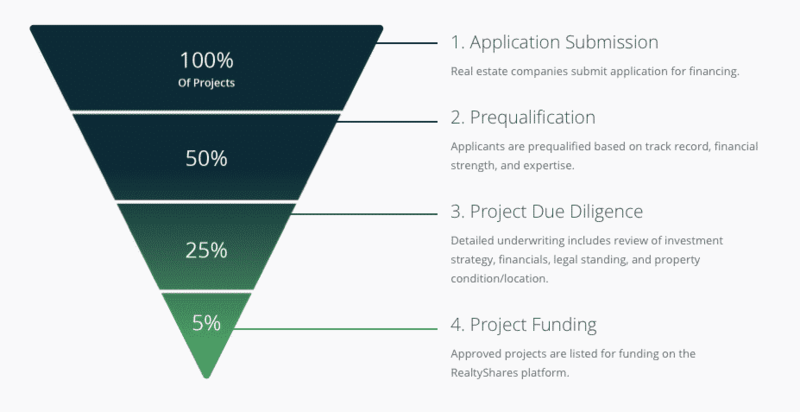 RealtyShares claims that of 2,700 applications received monthly, fewer than 5% succeed in making it past the 4 screening steps: application submission, prequalification, project due diligence, and project funding. Once you select a property, your capital commitment will count towards a funding goal. Each investment opportunity must meet its funding goal in order for the project to kick off. If for some reason a project does not reach its funding goal, your entire capital will be returned to you from an escrow account. When projects are approved and your money is allocated, you will have 24/7 online dashboard access to see how your investments are performing, access legal documents or tax filing documents, and track your payments. You can invest in residential or commercial property using equity or debt across 35 states and target return and hold times that best meet your financial goals. When you make an equity investment, you will own shares in a separate Limited Liability Company, or LLC. For each investment opportunity, RealtyShares creates a new LLC which in turn owns the real estate. As an LLC partner, you enjoy “pass through” tax benefits from cash flow distributions while limiting your legal liability. Keep in mind that your upside and downside as an equity investor is likely greater than if you invest in debt. As an equity investor, you can benefit from appreciation in the value of the real estate as well as regular cash flow distributions, typically quarterly. But if the project runs into difficulty because the real estate doesn’t appreciate in value sufficiently or doesn’t produce enough cashflow to cover debt obligations and distribute a surplus to investors, then you risk losing money. Compared to debt investors, equity investors must usually commit to longer timeframes, often of 5 years or more. You can think of investing in debt as akin to lending money to a real estate company who needs capital to finance a project. Generally, term lengths for debt investments are shorter compared to equity investments and are lower risk, but also have less upside opportunity. The way it works for debt and some “preferred equity” investments is your money will be allocated to debt obligations of RealtyShares subsidiaries that are connected to the performance of real estate loans made by the subsidiary. Sometimes, for mezzanine loans, RealtyShares may lend up to 90% LTC. RealtyShares is not a REIT, though you enjoy similar benefits to REITs, albeit with more control over how your money is allocated. A real estate investment trust, or REIT, is required to distribute at least 90% of its cash flow to investors. 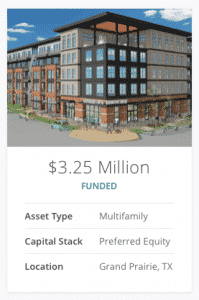 Like a REIT, RealtyShares also passes through cash flow to investors but unlike a REIT, you get much more control over how and where your money is allocated. In a publicly traded REIT, your capital may be invested across a range of real estate investments that include exposure you wish to avoid. For example, you may want to steer clear of the residential real estate sector. Or perhaps you want to avoid exposure to a specific state, such as Illinois. Or maybe you want to sidestep riskier opportunities, such as any construction and raw land deals. On RealtyShares, you can customize your investments to your own preferences so you better align your dollars with your financial goals and risk profile. RealtyShares was founded in 2013 but already has 92,000 registered investors, financed over 500 projects, and returned almost $60 million to investors. ✅ Low Minimum: The stated minimum to invest in private equity real estate deals at RealtyShares is $5,000 though in some cases as little as $1,000 is accepted for a project. ❌ Accredited Investors Only: To invest on the RealtyShares platform, you must be an accredited investor. ✅ Pre-Screened Investments: An expert team of real estate professionals prequalifies financing applicants based on track record, financial strength and expertise, and reviews financials, legal standing, investment strategy and property condition/location. ❌ Illiquid Investments: No secondary market exists to sell your investment if you want access to your capital, so you will need to commit to an illiquid investment for a variable timeline – generally equity investments have longer timelines than debt investments. ✅ Access to Commercial Real Estate: By pooling your assets with other investors, you gain access to commercial real estate opportunities that may otherwise have been out of reach and accessible primarily to institutions. ❌ Tax Considerations: You may received a K-1 or Form 10-99 tax document depending on what type of investment you select, which will likely add to your year-end tax filing costs. ✅ Diversified Real Estate Investments: As an investor, you can diversify your risk geographically across 35 states and 220 cities, and diversify your capital risk across multiple projects. ✅ Taxable & Retirement Accounts: IRA accounts and taxable accounts are supported on the RealtyShares platform. ✅ Passive Income: If you are looking for regular passive income as frequently as each quarter, equity investments, preferred equity investments, and debt investments have the potential to create a predictable income stream. RealtyShares is an online real estate investment platform. It enables investors to both purchase equity in real estate projects and group with other investors to provide finance for property loans. Investors can either invest in specific properties or across entire groups of properties. RealtyShares identifies and analyzes the best investments before making them available to investors. They cover the legal, underwriting, and due diligence in advance of offering an investment. In total, RealtyShares offers less than 10% of the investments they review to their clients. Historically, real estate investing was only available to investors with a large amount of resources. By enabling investors to purchase shares in a development, or group with others to provide a loan, RealtyShares reduces the cost of entry and allows investors to spread their risk across multiple properties. Investing in real estate with RealtyShares is passive. You choose the investments you want, and the real estate site takes care of the rest. RealtyShares monitors and manages your investment, keeps you updated through your personal dashboard, and distributes funds when you exit the investment. RealtyShares has upwards of $870 million in a wide range of properties (commercial, industrial, and residential) across 41 states. This wide range of investments makes it likely you can find something that meets your investment criteria. Historically real estate has shown a low correlation (sometimes negative) with other asset classes, as well as having lower volatility. It is likely that investing in real estate will reduce the overall volatility of your portfolio if you have historically only invested in stocks. Exiting a property either requires it to be sold (if you hold equity) or for the real estate loan to be paid back. Depending on the project, this might be just a few months or several years. For this reason, investors should only invest money they won’t need access to in the immediate future. This is a great opportunity for investors who want to add real estate to their portfolio but without directly purchasing property themselves. ‹ John Krasinski Net Worth – Wow, $33,000,000!